Searing Blaze or Skullcrack are better options than Incinerate, it's regeneration clause isn't that relevant. Bedlam Reveler is great in a high spell count deck as are Monastery Swiftspear and Kiln Fiend... You also want a madness enabler, Lightning Axe or Bloodrage Brawler would work. Now, a quick note on Guttersnipe, it's a trap, partly because he's a horrible topdeck and partly due to cards like Pyromancer Ascension and Shrine of Burning Rage, which perform a similar role but are harder to remove and cost less to cast. Eidolon of the Great Revel appears in modern burn because your opponent is forced to burn themselves to just play magic and most spells used in modern are under 3 CMC, since it's a turn 4 format. Simple test, if Guttersnipe and Flames of the Blood Hand or Pulse of the Forge (neither are great burn spells), which would you rather cast on turn 3? In almost all cases you would rather play the spell because Guttersnipe does nothing that turn. Hope this helps, good luck and have fun brewing your deck. 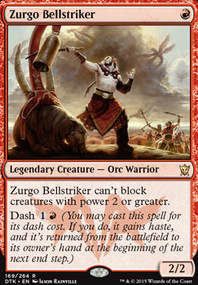 Mono red has a lot of functional budget cards kicking around, thanks to tier2 cards being printed basically every set. I had a quick glance through the list of devil cards- Impetuous Devils looks fun, Wolf of Devil's Breach and Flayer of the Hatebound/Scourge Devil are interesting cards pointing to a possible self-mill strat. If you're playing a casual format, its important to measure your decks' power and how 'unfair' it feels to play against- noone wants to feel like their games are a coinflip. 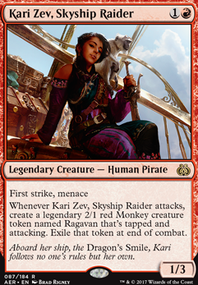 So while the 'red deck wins' go wide strategy with Bedlam Reveler, Shared Animosity and Rakdos Cackler is available, I'm gonna talk about something more fun in less competitive metas- Big red. Big red likes setting down mana rocks to get to 4-5 mana early, using spells like Roast to clear the board. A creature base in the 3/4/5/6 slots isnt' unreasonable, so long as you can cast early spells to clear out creatures. I'd look at a set of Roast, Slagstorm/Pyroclasm, and Pulse of the Forge. If you can just blam creatures off the board and threaten their life total on your end step, getting to the big devils isn't too tricky. 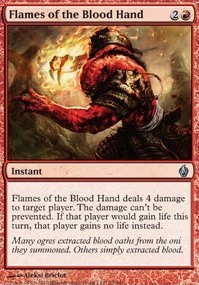 Flames of the Blood Hand is an amazing RDW sideboard card because it helps stop decks that go 'I gain 10 life, you literally can't win against me now'. Your value plan should only be worried about life in the 'Is this making them completely immune to damage' sense. If charmbreakers stick, you don't have to worry about a foe being at 30 life. If your meta is lifegain-combo heavy, then consider sticking an Everlasting Torment- its on theme and should stick around longer. Last, mana. Specifically, mana rocks. The beating heart of casting big spells in red. Mind Stone, Star Compass, Talisman of Impulse, Boros Signet/Rakdos Signet, etc. They are really good- either people are wasting cards on artifact removal, which doesn't massively affect your gameplan (at least, not unless its a competitive meta with Ensnaring Bridge everywhere), or you get to cast 3/4 drops early. The best even draw you a card when you no longer need them. 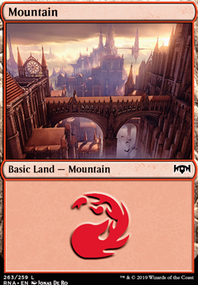 It also can easily take the place of some of the lands you play- The rule of thumb is generally that 2 rocks is worth 1 land. This should let you more reliably cast bigger creatures. I wouldn't normally mention it because I don't like the card, but Rakdos Keyrune is on theme. Elvish Mystic - more cheap dorks is great if you want consistancy. They'll even spook your opponent into playing around Elvish Archdruid. If you want to run a lot of 5 drops you can also look at Pentad Prism. Temur Battle Rage outperforms Ghor-Clan Rampager in every deck I have tested it in. Abrade does everything strike does, but it kills Ensnaring Bridge too. (also, that price has ticked up- look for standard played damaged as it rotates out). When you don't have Lightning Bolt, there are alternative burn spells- especially in the 2 drop slot. Roast does a good job clearing out creatures. Fling (and its little brother, Thud) is devastating. The scry2 on Magma Jet is very powerful in budget decks, especially when you're frantially digging for that last point of damage. Searing Blaze can put in work. 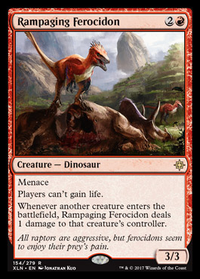 As for alternative creature choices, things like Keldon Marauders hit like trucks in bushwhacker lists. Hidden Herbalists sometimes sees play in Burning-Tree Emissary lists alongside bushwhacker, but demands a fetchland most of the time- which is less than budget-friendly. Token generators like Dragon Fodder, Mogg War Marshal and Goblin Instigator are amazing in 8-whack lists. Skirk Prospector can back that up to power out some surprisingly resilient red and green 5 drops- of which there are too many to count, but Samut, Voice of Dissent and Stormbreath Dragon are particularly notable. Haste is very strong on a decent body, and there are lots of cards that offer it. Bad news- costing 1 mana is mostly just lightning bolt's thing, and it defines the format. In paper, keep an eye out for damaged white border copies- they're playable sleeved, and way cheaper, and you will play them in the future. 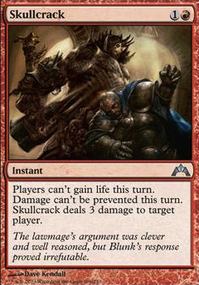 Skullcrack or Atarka's Command are basically mandatory for decks that lose to Feed the Clan and friends. Sometimes you can make Flames of the Blood Hand work- you should have the mana to support it. If you're always going to race a deck that has lifegain, your sideboard cards should stop them gaining life, be it Everlasting Torment or Rain of Gore style (should you be looking at a longer, grindier game), there are options if you search them out. Most of all, have fun. A lot of the most optimised decks are boring- if you love a card, play it. I still run Incandescent Soulstoke ramp at FNM sometimes. Sometimes it even wins. I´ve changed a bunch of things and I think this list should be way better. I would have done the same changes if I would´ve known about the cards u guys suggested but I had no idea those great cards existed (Thank you for helping me discover them :)). Also I really like the idea of burning bridge/combo decks but I think for this deck I will stick to a more creature centered playstyle. As for Grim Lavamancer I am not sure if I want to implement it because I would rather attack with a wizard then tap it because of Shared Animosity allthough it can be powerful to tap it multiple times (Same goes for Dismissive Pyromancer). By the way I´ve put both Skullcrack and Flames of the Blood Hand in the sideboard (I am not sure which one would be better). PS: I always thought Ahn-Crop Crasher was a wizard because I read warrior as wizard lmao. I highly reccomend Grim Lavamancer, as it adds a lot of range to RDW. I'd consider something like Browbeat in place of ahn-crop. I'd also much rather see a Metallic Mimic or similar instead of Ghitu Journeymage. Doublecast is a great spell, and when run alongside Howl of the Horde or similar, you can jam a lot of lightning bolts into a single turn. The big problem is that unless you are running a combo list and spending 6-8 mana, it will always deal less damage than Lava Spike. Reverberate has some added utility in copying your opponents spells, but its not exactly reliable. If you go this route, you want Insult. Sideboard Skullcrack or Flames of the Blood Hand. Four of. You will need them. There are better guides to RDW out there that can lead you through sideboarding, but it basically boils down to the split between lifegain hate, graveyard hate and artifact hate, as well as ways to play around Leyline of Sanctity. I agree with sylvannos that Goblin Guide is strictly better than Vexing Devil and I probably won't build the deck without GG despite the cost. I also agree that 4 copies of the The Flame of Keld may be overkill but I am not sure what to replace them with, Searing Blaze seems pretty unimpressive in a deck with 18 basics. I think a 2-2 or 3-1 split between The Flame of Keld and something else would be good, but I'm not sure what to put in. 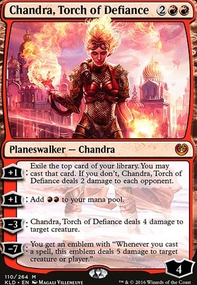 Flames of the Blood Hand comes to mind, as does Burst Lightning, Rampaging Ferocidon, Incinerate, or Bomat Courier. I don't know, what do you guys think? Pretty sure Skullcrack is better than Flames of the Blood Hand. It does 1 less damage, but the difference between 2 and 3 mana is huge, plus Skullcrack also makes damage from other spells and creatures unpreventable while Flames doesnt.